Rocking leather jackets, teased hair, and loud music, Nova Rex traveled across America in the 1980s and early 1990s, living the rock 'n roll dream. While never reaching the heights of mega stars such as Mötley Crüe and Quiet Riot, the band packed clubs with screaming fans, released records on major labels, and landed corporate sponsorship. Their wild look, sound, and attitude epitomize the outrageousness and hedonism of the hair band era. The museum recently collected materials from Nova Rex as part of our ongoing efforts to preserve historical instruments and represent the diverse forms of American popular music. Among the materials recently donated by bassist Kenny Wilkerson are a pair of leather chaps, an instrument sponsored by Budweiser, and a cassette tape featuring a mouse in a tank-top holding a knife. Needless to say, this is the first sound recording featuring a knife-wielding mouse in the museum's collections. These objects are not currently on display in the museum. Kenny kindly answered a few questions for us about Nova Rex, metal's place in American history, and of course, his hair. Nova Rex material recently donated to the museum. Photograph by Danielle Koontz. We're curious about your musical influences, but first... who were your fashion influences? Mötley Crüe, Poison, Van Halen, Bon Jovi and even KISS. The flamboyant outfit you donated is so indicative of the type of music Nova Rex plays, the variant of heavy metal now called "hair metal" which dominated MTV during the late 1980s. Could you tell our readers your thoughts on these clothes? We wore the most outrageous things that we could get our hands on. "Look at me, look at me!" It was our uniform for rock 'n' roll. The clothes distinguished us as hair metal rockers. When we went out in public, they didn't ask us what band we were in, they would just ask us for an autograph. The other aspect of the "band" look was that men wore a lot of feminine clothing. In retrospect, do you think you wore them out of rebelliousness, because they fit into your scene, or simply because they were cool? It wasn't rebelliousness. It's what all the musicians that I looked up to were wearing and at the time, I thought the clothing was really cool. Plus, the girls were definitely into the look. Band member Kenny Wilkerson in 1988.
Who did you try to emulate or look like? We emulated the fashion of the day. There was no one in particular, anything went, especially if it came out of your girlfriend’s closet. Would you call yourself a "glam band," "hair band," or something else? Looking back, I would say "hair band," because of how we looked, but musically it was just rock 'n' roll. How much teasing did it take to get your hair that big? Did you have help? Seriously, we need to know. The teasing probably took about 20 to 30 minutes, and yes, I always had help. Our singer was really good at it. He was a closet hair dresser. Of course, we always had the help of a variety of females and Ultra Super Hold Aqua Net in the pink can. Ok, hair spray and makeup were a big part of the metal scene, but the most important thing is the music. What were some of Nova Rex's musical influences? Led Zeppelin, ACDC, Van Halen, and early Whitesnake, anything with a groove. Why were you attracted to these bands—what about them did you find compelling? They were all Blues based bands, with a groove and fresh musical arrangements with hooks, and the musicianship had to be there. Nova Rex in more recent years. Were there music types you didn't like/rebelled against? Nova Rex started in Canada, but has been located in places as diverse as Florida, California, and Indiana. Describe a typical audience. The crowds were made up of lots of girls with big hair and mini-skirts and intoxicated, rowdy guys. Concerts were a place where people could go and act totally uninhibited without consequence. It was a place where people could go to get away from their everyday life and be part of a bigger scene. Are they the same in all parts of the country, or are they different based on what state you are in? Yes and no. In my experience, the further Midwest to East Coast that you went had more of a rock edge. The further West, particularly Los Angeles, was more "glam/flamboyant." Is there a concert that sticks out as most memorable to you? Where was it and why was it such an important experience? It was New Year's Eve 1991 after we relocated the band to Indianapolis, IN, from LA. We were on the run from the up and coming grunge scene which had taken over California. It was a major radio station's New Year's Eve event and it was our first performance after relocating. We were playing in front of 20,000 people. We felt like we had made a good move and had bought ourselves more time. Signed chaps. Photography by Daniella Koontz. Today's technologies have transformed the music industry. 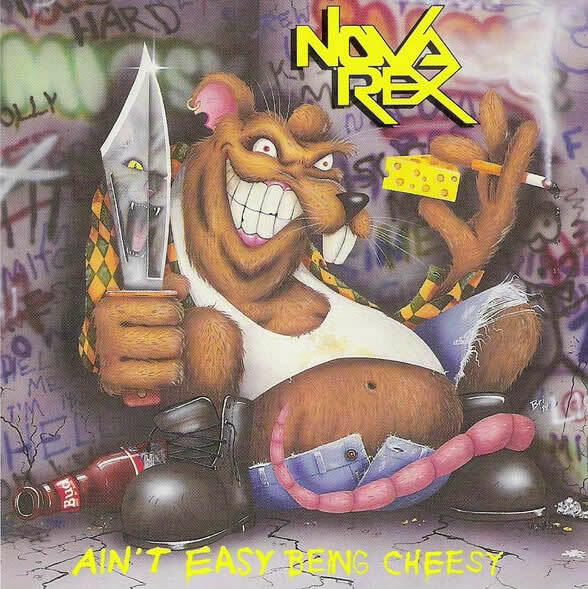 In recent years you guys have been able to put out the well received documentary Nova Rex: Ain’t Easy Being Cheesy as well as a new Greatest Hits record. How different has the experience of putting together your film and album today been with how you used to make music and promote your band? Back in the day, you had to do a lot more ground work such as flyers, traveling, and performing live to get your message out. As far as recording, you actually had to know what you were doing. You couldn't cheat with the digital technology. It was also much more expensive. Now, with the latest computer gadgets, everybody can record and film at home. In the marketing aspects, I believe it is much easier to reach out to a larger fan base with social media, such as YouTube and Facebook. Do you personally enjoy using such things as social media, or are they more a means to an end? The new social media has its pros and cons. The good thing is with YouTube and Facebook, etc., everybody can be heard. The bad thing is, that when everybody can be heard, nobody gets heard. Why do you think it's important to preserve artifacts and memories from the hair band era? It was a great and distinctive time in American history for music. It is important to preserve artifacts and memories from the hair band years, because it was the last huge trendsetting era. What motivated you to make your documentary and donate items to the museum? If you're under the age of thirty, you may not be aware of this time in our history. It’s important to preserve a significant part of the population's youth experiences. Many of us have held onto that decade as a time when we developed the way we think and operate in our lives today. What do you think your music says about being an American? Hair metal originated right here in the good old USA. It represented a time of excess and a carefree attitude with its crazy fashion, catchy hooks, and guitar riffs. It says... I can do whatever I like, I'm Free. Eric Jentsch, who interviewed Wilkerson, is the deputy chair of the Division of Culture and the Arts at the National Museum of American History. He has also blogged about artifacts from the Olympics and gave us a tour of hip-hop collections in the museum.